You can choose a delivery date (up to a year in advance!) as part of the checkout process. You will also be able to choose a delivery option. This choice will depend on how important it is that your balloon arrives on the selected day or how quickly you want your gift to arrive! Please see our Frequently Asked Questions if you have any further queries about Delivery. Note! Please note we only deliver balloon gifts to addresses in the United Kingdom. We are unfortunately unable to deliver balloon gifts to the Channel Islands (Jersey & Guernsey). Please be aware that delivery to Northern Scotland, Northern Ireland, Isle of Man, Isle of Wight & Isles of Scilly can sometimes take two working days to arrive so please allow extra time when ordering to these areas. If you choose First Class Delivery we will send your balloon 1-2 working days before your chosen delivery date. 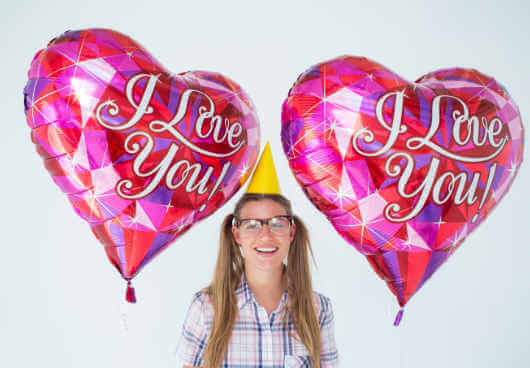 Usually your balloon will arrive on your preferred date or the day before. Very occasionally this delivery option can take longer than 1-2 working days, especially around Christmas and other busy periods. Please choose the Guaranteed Delivery option to guarantee delivery on your preferred date. If you select the Guaranteed Delivery option we will dispatch your gift the day before your chosen delivery date. It will arrive on your requested delivery date anytime throughout the day. This delivery option is available from Monday to Friday. A signature is required from someone at the delivery address. If you select the Saturday Guaranteed Delivery option, we will dispatch your gift on Friday to arrive on Saturday anytime throughout the day. Some of our balloon gifts are so big (up to 6ft!) that there are a few delivery exceptions to be aware of. These balloon gifts are marked with the mega icon and cannot be delivered on a Saturday. Please choose Monday to Friday as your delivery date. We are also not able to deliver these larger balloon gifts to the following areas: The Highlands & Islands of Scotland - postcodes AB37, AB38, AB44-45, AB53-56, IV7, IV9-12, IV14-28, IV30-32, IV36, IV40-56, HS1-9, KA27-28, KW, PA20-38, PA41-49, PA60-78, PA80-88, PH17-26, PH30-44, PH49-50, ZE. Also Cumbria (CA18-27, LA15-23), Northern Ireland (BT), Isle of Man (IM) or Isles of Scilly (TR21-25). Please choose an alternative balloon if you would like to send a gift to one of these locations or on a Saturday ‐ perhaps one of our superb Special Bouquets or perhaps a fantastic Photo Balloon!